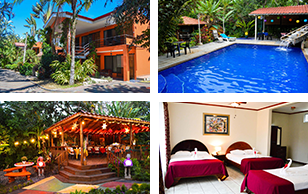 Hotel Brilla Sol is located 4 km west from the International Airport in “El Roble de Alajuela” and is an excellent strategic place in which you can start and finish to plan and enjoy your trip. We are about 25 minutes from Downtown San José and 10 minutes away from Downtown Alajuela. If you are looking for a place of tranquility or just relax this is the place because our guests are our reason, they are the most important people, because we do not only want a new customer, we want to make new friends. Our staff will be able to help and recommend the best places which are of your interests, depending on your preferences for exploring Costa Rica and provide a comfortable and unforgettable experience for visiting our beloved country. We are a Tropical Paradise like an oasis just near the International Airport, the Brilla Sol staff works hard to provide our customers a comfortable and memorable stay. We hope that you decide to visit Costa Rica stard with us and planning your trip here and experience its natural beauty with friendly people. We really enjoy what we do at Hotel Brilla Sol and we try to do our best in order to make your stay with us comfortable, secure and to your ultimate satisfaction. We are here to help you with anything you need. Please do not hesitate to contact us. Our rates include: taxes, a Costa Rican style breakfast, and shuttle service to and from the airport.